FEBRUARY FAVOURITES INC MAKEUP GEEK, MORPHE BRUSHES & MORE. I decided to purchase the oh so famous Z Palette from Beauty Bay as I was running out of places to store my Makeup Geek eyeshadows and it was driving me mad keeping them in the little cardboard pouches. I decided to go for the black Z Palette as you may already know it's one of my favourite colours. The Z palette came with around 10 circular magnets and 10 square, which was great. Quick tip: make sure you have a permanent marker with you when you're creating your Z Palette as you can write the eyeshadow shades on the back of the magnets so you don't forget the names or what you're using. Ok so I've clearly started adding to my Makeup Geek collection and boy do I love this brand when it comes to their eyeshadows. The Makeup Geek eyeshadows are highly addictive and I want them all! I just love how highly pigmented they're and how buttery the shadows are to blend out and work with. These are now my favourite eyeshadows to use for everyday use or special occasions. I can't wait to add even more to my collection. The last time I showed you any of these eyeshadows I only had a few, which you read all about just here. 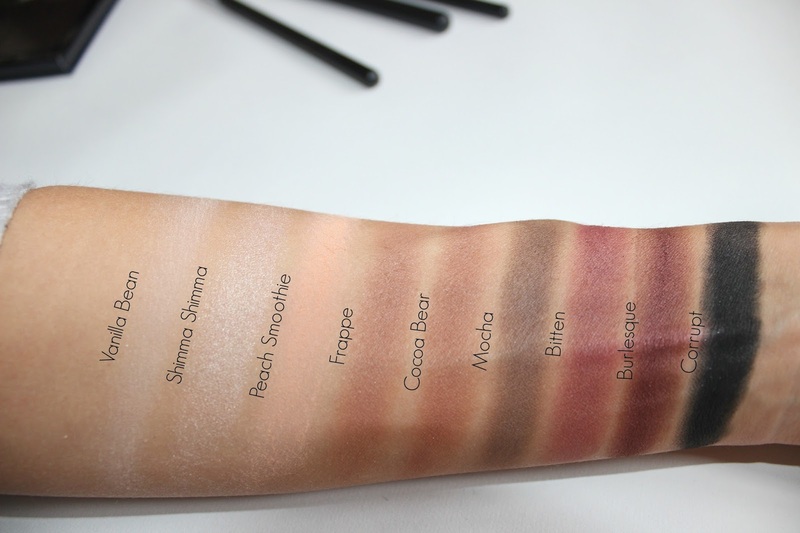 Also I don't know why Frappe and Cocoa Bear look so similar in the swatches above. Vanilla Bean - Vanilla Bean is a gorgeous vanilla shade that has a peachy/beige undertone. This eyeshadow has a matte finish with a hint of sheen to it. I think this eyeshadow works well as a base when you apply all over the lid/eye area as a starting point for any eye look. Peach Smoothie - This is a gorgeous light peach shade with a matte finish. I find that this eyeshadow works great as a transition shade. Although I have noticed more fallout with this eyeshadow than any of the others that I own. I love using this to correct any in corrections with darker shades in the crease. Mocha - This is the best brown eyeshadow I've ever owned. Mocha is a deep, rich brown shade that has a matte finish. 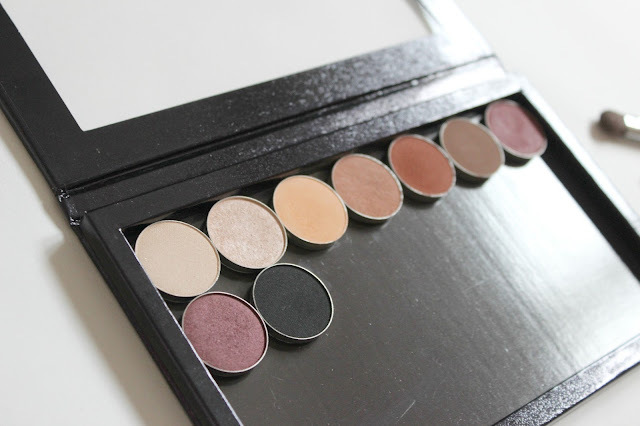 This eyeshadow looks amazing in the outer v when doing a neutral smokey eye. Corrupt - When I first swatched this shadow I thought wow this really is black black! It might sound dumb, but theres a lot of black shadows out there that have grey/ashy undertones to them and it easily puts me off using blacks in any of my eye looks, not this one! This is the most gorgeous matte black eyeshadow with the slightest hint of sparkle. MB11 Angle Liner Brush - Beauty Bay £2.50 - When I first received this brush I was quite shocked at just how big it was, I was expecting something teeny, but as you can see in the photos above it's not really that small. 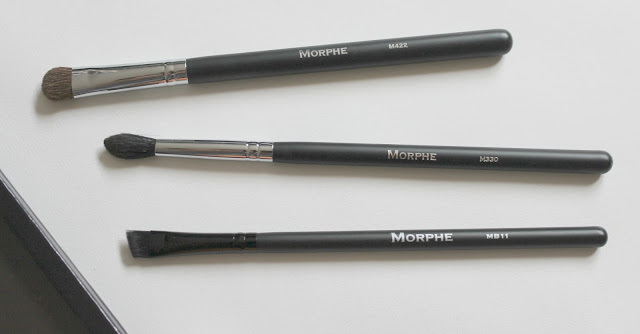 This brush is definitely not one for a super fine line, but it is great for apply eyeshadow as a liner and I've been loving this one for my brows. M330 Blending Crease Brush - Beauty Bay £4.75 - This is one of the best blending brushes I've ever owned. It is the perfect shape for the crease of my eye, super soft. 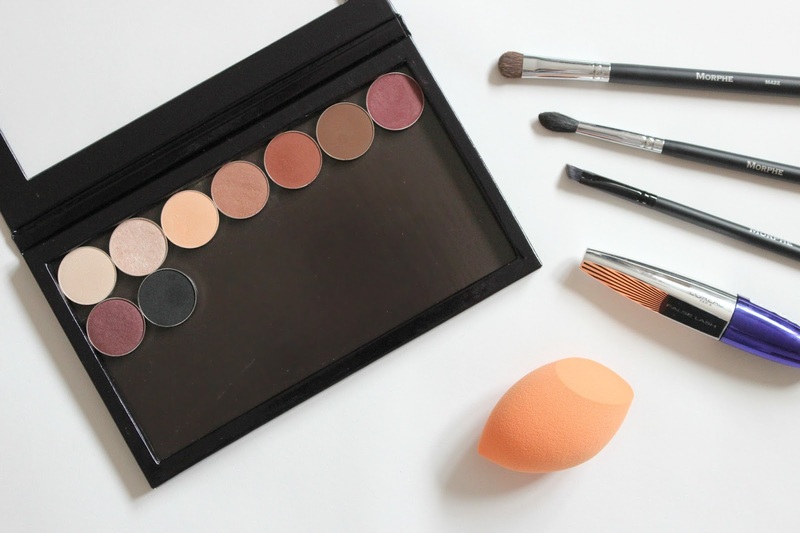 The tapered point really helps to get that eyeshadow into the crease of the eye. When blending out those transition shades. M422 Cresent Shadow Brush - Beauty Bay £3.25 - This brush is my new favourite brush for applying product to the lid. 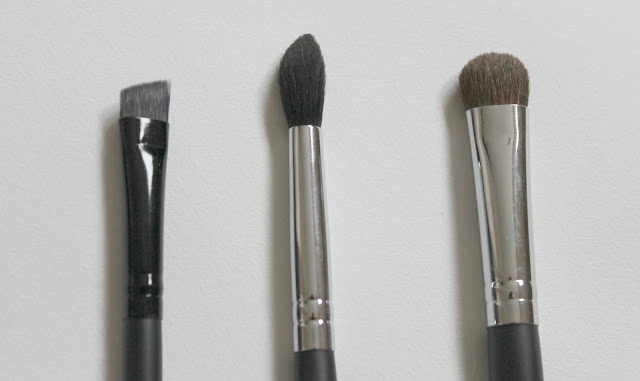 The density of the brush makes it easy to pack eyeshadows on the lid. 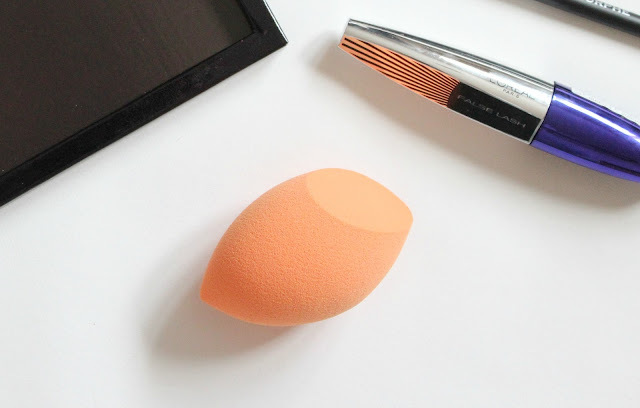 I was desperate for a new beauty blender and after watching so many people use this one in their YouTube videos I had to give it a go. Now I haven't applied my foundation with a beauty blender for quite some time and I'd forgot just how great they were. The Real Techniques beauty blender is so soft and squidgy and leaves your makeup looking flawless. I use mine with liquid foundation and liquid concealer. I also found this beauty blender easy to clean unlike the other ones I've tried before that just ended up going in the bin. If you read my previous post you'll know just how much I loved this mascara. To read more about this mascara | click here. After I purchased this product I went home, removed my make up and tried it out. I was amazed right away. The comb is the perfect fit for the eye and it really does get to the root of the lashes. It must have taken me about 30 seconds/1 minute to apply one layer of mascara and to feel truly happy with the outcome of the lashes. How quick and ideal is that for when you're in a rush first thing in a morning? LANCÔME JUICY SHAKER | MELI MELON & BERRY TALE.